She says it is “pretty as a picture; so long as you don&apos;t look too close at the homemade liner and mattress cover.” Image via Gumtree. 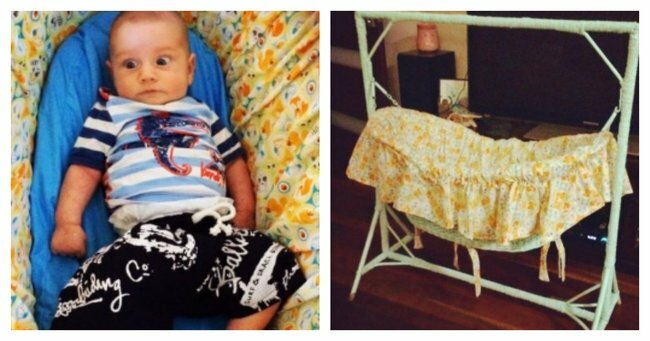 For those who aren&apos;t quite sure whether the advertisement for the bassinet is real or not happily it comes with pics complete with Kobie’s sweet baby looking just as horrified as the community midwife would be. A Community Nurse will let out a squeal of dismay upon seeing it. Image via GumTree. "I had images of myself, glowing and slim, dressed in long white flowing dresses whilst I rocked my angelic baby in a white, wicker cradle." Image via Gumtree. Who could resist right? Image via IStock. If you are interested in the bassinet she mentions she’ll even throw in a bottle of vino.. and help you drink it. This 100+ year old bassinet was designed in a time when babies were men, and those man-babies didn&apos;t need no comfy, flat, safe cradles to sleep in. Co-sleeping? Pffttt... Put a blanket in a cauldron and those man-babies will have water boiling for your morning cuppa when you get up to feed them. Word of warning: midwives hate it. The old-fashioned design of the bassinet is such that, upon seeing it, a Community Nurse will let out a squeal of dismay, whose pitch and captured horror will lead you to frantically glance at your undies drawer and wonder if you forgot to tuck any &apos;toys&apos; away that had somehow migrated into the cradle and were currently being used as a pacifier by your sweet child. Let&apos;s face it; it wouldn&apos;t be the first time. The people this bassinet would most appeal to are middle-aged women who wander markets and festivals with their creepy life-like dolls in old, turn of the century prams. The type of women who have a look of elation, tempered by a studiously exasperated groan when stopped for a look; followed by a slightly murdery glare when asked if the baby is real. The type of woman who might seem well rounded and down to earth, until one looks under her floorboards. Now that I&apos;ve endeared myself to my target audience, let me just say that the bassinet is as pretty as a picture; so long as you don&apos;t look too close at the homemade liner and mattress cover. These were surprisingly expensive at $50 for fabric, and $3500 for the sewing machine, which somehow ended up in pieces on the living room floor after being thrown, stomped on, and then beaten into submission with an axe. Anyhow, we really need to sell this lovely bassinet that I bought in a whimsical moment in early pregnancy when I thought being pregnant would be a holy, other worldly experience and had images of myself, glowing and slim, dressed in long white flowing dresses whilst I rocked my angelic baby in a white, wicker cradle. f you&apos;re not convinced to buy it by now (but who wouldn&apos;t be? ), I&apos;ll throw in another offer. If you pay $100 for it, I&apos;ll throw in a bottle of wine and drink it with* you.